Thea is not in good shape. That damn bloodlust of hers is actually killing her. Thea chose not to give in to the bloodlust, and now it’s draining her own life force. Luckily, Nyssa has found a magic elixir that will cure Thea for good. Ah. But there’s a catch. 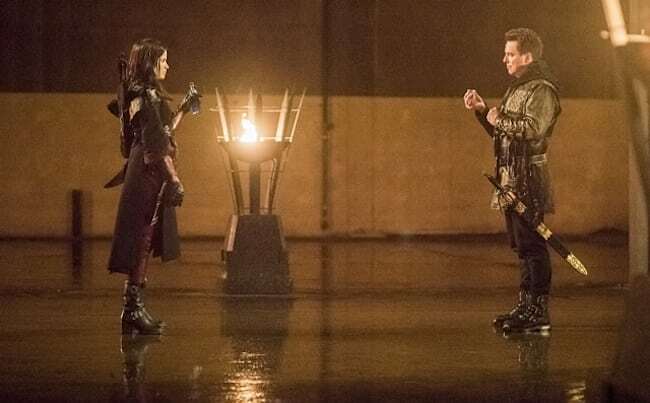 In order to get the cure-all elixir, Oliver has to help Nyssa become Ra’s al Ghul. Arrow seems to be pulling out all the stops since returning from the winter break. Last week was the Ghost of Guest Star’s Past and this week continues with that streak. Ollie, as we know, has been a bit more optimistic this season, and that has been starting to show in his decision making process. When it comes time for him to decide to help Nyssa kill Merlyn, so she can become Ra’s al Ghul, he decides to embark on a diplomatic mission. Ollie’s plan is to get Merlyn to simply exchange his title of Ra’s al Ghul for the magic elixir. Everyone agrees to this but them BAM! Merlyn is all like “Nope. I’m gonna do all sorts of back stabbing.” Ain’t that just like a villain? While all this is happening, Felicity finds out her dad is actually the Calculator. The Calculator! That old jerk hacktavist. Felicity did not take that well. Called the cops. Got him all shades of arrested. The show then zips back to the Ollie/Nyssa/Merlyn story. Ollie has convinced Nyssa and Merlyn that they need to settle this the old-fashioned way. Mano o Womano for the championship belt. But Ollie has an ace up his sleeve. As Nyssa’s husband, in the eyes of the League of Assassins, Ollie can fight in her stead. Ollie bests Merlyn. Merlyn asks Ollie to do it, to kill him. Ollie, in a crazy turn, chops off Merlyn’s hand and can now freely grab the ring and give it to Nyssa. That was quite the fun scene. Tense, dramatic, actiony. And then Nyssa disbands the League of Assassins and melts the ring. Dude lost a hand over that. Merlyn is pissed at Ollie and vows revenge. He goes to a secret meeting with Darhk (remember him?) and tells Darhk about Ollie’s son. Dang. That’s rough.